What Is Interval Training? Is This The Best Exercise To Burn Fat Quickly? 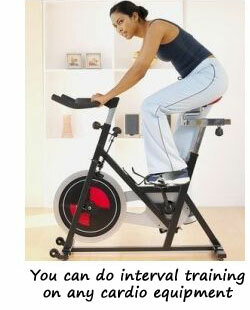 Home » Best Exercise to Burn Fat » What is Interval Training? Intrigued about What Is Interval Training? Discover How to Easily Adapt the Best Exercise to Burn Fat Quickly to Your Unique Needs and Fitness Level! Are you asking, “What is interval training?” Whether a fitness enthusiast or totally out of shape, if you want to boost your metabolism and burn more body fat using shorter workouts, read on. Simply put, interval training means doing any cardiovascular exercise in a very specific way: by alternating brief bursts (30 sec – 4 min) of anaerobic, high-intensity exercising with aerobic, low-intensity recovery periods (1-5 min). …through a process called excess post-exercise oxygen consumption (EPOC). EPOC uses up your stored fat to restore your body to its normal condition, long after your workout is over. In other words, EPOC initiates a fat-burning process within your body that lasts up to 48 hours. What kind of cardio can you use for interval training? You can do interval training outside (walking, jogging, biking, rollerblading, skating, swimming) or on any type of cardio equipment (treadmill, stationary bike, rowing machine, stepper, elliptical machine). You may be surprised to know that originally developed by the Swedes and called fartlek (“speed play”), interval training has been used as the basis for athletic training for many, many years. What is Interval Training Used for Today? Apart from preparing for an athletic competition, exercising to increase the fitness level and get back in shape, today interval training is more and more used by people who want to lose weight in the shortest amount of time. Why? Because this really is the best exercise to burn fat fast. The best part of using interval training for weight loss? You can develop your workouts one step at a time. For example, if you are a beginner, a once-a-week session will be enough to add it to your normal workout routine. Then, as you get more energy and acquire more endurance, you can increase the frequency of interval training to 2-3 times a week. Just be sure to listen to your body, warm up 3-5 minutes, and end your interval training with body stretches for another 3-5 minutes. Also, you can decide how hard you exercise during the high-intensity periods and how long you recover during the low-intensity periods. As a beginner, you should start where your body allows you to and then, as you build up endurance, advance to intermediate and more advanced interval training workouts. To make sure you are pushing yourself far enough to actually benefit from your interval training exercise, you can either rely on subjective factors (like your pulse, your perception of the workout intensity and how you feel after the exercise), or use a heart rate monitor, which keeps your workout simple storing your accurate heart rate, how many calories you’ve burned and monitoring your progress over time. A simplistic way of optimizing your interval training workouts is alternating short periods of working out at approx. 90% of your estimated maximum heart rate (MHR = 220 – your age) for the anaerobic, high-intensity bouts and longer recovery intervals at 65% of your MHR for the aerobic, low intensity breaks.